Graduated from Texas Tech in December 1984, married Sam in December 1985. Blessed to have been a stay-at-home mom while my kids were growing up, started subbing at their school when Hunter began kindergarten. Participated in an Alternative Certification Program, passed the tests but still need to student teach - may just continue to sub cause I love the flexible schedule. Now teaching Pre-K at a Christian preschool four days a week - love it! Vicky Gregory Thompson has a birthday today. Vicky Gregory Thompson updated profile. View. 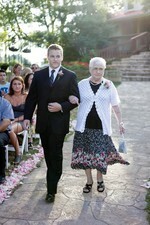 Hunter walking MiMi (my Mom) down the aisle. This is just 8 weeks after open heart surgery - still going strong!